electrochemical etching of metal surfaces using a small amount of electric current, an electrolyte, a marker with pad to hold the electrolyte and carry the current and a stencil with the required image. 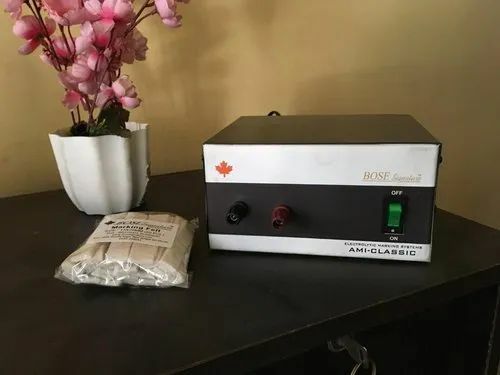 Incepted in the year 2002, BOSE Signature is one of the leading manufacturers and suppliers of qualitative assortment of electrochemical etching machines and consumables. Our range is acclaimed for its features including sturdy constructio, low maintenance, user friendliness and others. These are used in the areas such as automoblie industry, stainless steel kitchen ware industry, and many others. We can also undertake job work for chemical etching on the basis of customer's requirement. Our range is suitable for making marking permanently, aesthetcally with minimum cost. We offer a wide range of Manual Etching Machine, Semi Automatic Etching Machine, Electrochemical Etching Machine, Chemical Etching Machine, Electrolyte AE34, Metal Marking Electrolytes, Electrolytic Mrking Machine, AE34 Chemical, Metal Marking Machine, and Etching Consumables. The consumables including electrolyte, marking head and photographic stencils are appicable in numerous ferrous and non ferrous metallic items and other materials such as cutlery, taps, drills, hand made and automatic tools, crank pins, engine valves, surgical and medical instruments, bath ware, sanitry hardware, ball bearings, gears, engine components. Under the excellent guidance of our proprietor Mr. Amit Bose we have achieved a quick growth in our field. Our dedicated team has also helped us in achieving our targets and goals. We provide customized solutions for both automatic and plant automaton projects for chemical etching process used in marking numbers, emblems, logos, dates, serial/batch numbers and serveral other data on various components of different applications and size Owing to all these reasons, BOSE Signature have achieved a lage client base in the domestic markets.